Aches now holds the record for most Championships in CoD eSports. With FaZe Clan’s win at MLG Columbus last weekend, Patrick “Aches” Price has become the winningest player in Call of Duty history and currently holds 19 championships to his name. Competitive Call of Duty has come a long way since Aches began his career back in 2008 when Modern Warfare was released. In 2010, he competed at the Major League Gaming National Championship event in Dallas under the LeveraGe organization. This was the beginning that would spark the greatest career in the history of CoD eSports. Aches and his team exploded onto the scene in 2010-2011 when Black Ops was featured on the MLG Pro Circuit. During his time on LeveraGe, Aches began to compete with Tyler “TeePee” Polchow, who would go on to be his teammate for over three years. Together, they won multiple championships during the Black Ops season and established themselves as one of the best teams in the game. After a successful year on the MLG Pro Circuit, CoD eSports was left out to dry in 2011-2012 when Modern Warfare 3 was released. MLG decided to not feature MW3 on the pro circuit, resulting in a limited amount of LAN tournaments across the globe. Many pros chose not to compete full time and took a break until the next game was released. With the launch of Black Ops 2 in 2012, CoD eSports did a full 180 and quickly became a prominent feature of MLG tournaments again. Aches began to compete under the CompLexity organization with TeePee and Ian “Crimsix” Porter. Together, with a fourth player that would change frequently over the years, they went on to become the most compelling team in all of eSports with a total of seven LAN Championships out of the 11 they attended in the Black Ops 2 season. For the 2013-2014 season of Call of Duty Ghosts, Aches and his team continued to dominate the scene and went on to win the first five events of the season, including the World Championship. CompLexity holding up their prize check after dominating at the Call of Duty World Championship event. Photo by Call of Duty. Evil Geniuses, a very renowned organization in eSports, chose to buy out the roster from CompLexity. During their first event as EG, the streak of championships ended with a 3rd place finish at the MLG X Games Invitational. Aches’ eight championship win streak was the longest for any player in CoD eSports history. At the end of the 2013-2014 season, personalities began to clash and the teammates of EG wanted to split up and seek new teams. After resolving some contractual issues, the players became free agents, and Aches was left alone to find a new team to call home. People of the CoD eSports community were shocked and saddened to see the long time duo of Aches and TeePee split up after over three years of pure dominance. 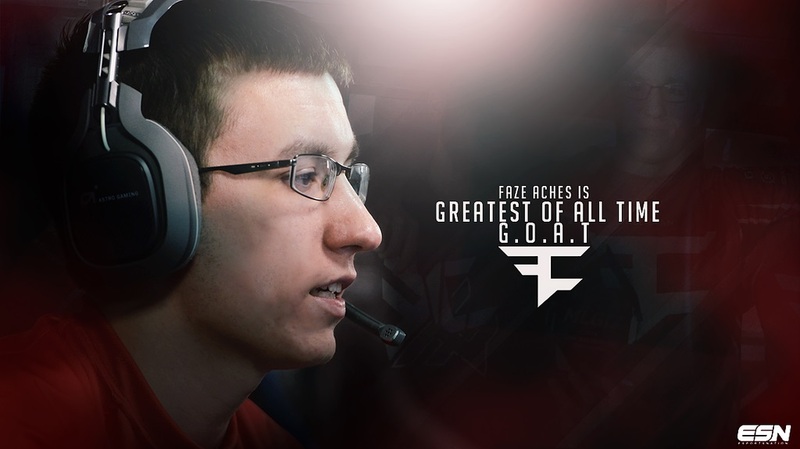 Aches decided to team up with Doug “Censor” Martin, Brian “Apathy” Zhelyazkov, and Austin “Slasher” Liddicoat under the FaZe Clan organization for Advanced Warfare. The first event of the 2014-2015 season for Advanced Warfare was held in Columbus, Ohio and hosted by MLG. Aches’ rivals at OpTic Gaming were heavily favored to win the event with the roster of Matthew “Nadeshot” Haag, Seth “Scump” Abner, Matthew “FormaL” Piper, and Aches’ ex-teammate Crimsix. At the time, nobody saw FaZe being able to advance to the finals. Aches told people that he was playing to win and anything short of a championship would be a failure. FaZe played well during the initial phase of the tournament and finished 3-1 in their pool, placing them into the winner’s bracket of the tournament. The night before Championship Sunday, Aches injured his hand and was taken to the emergency room at a local hospital to get stitches at the base of his thumb. The injury was severe enough to jeopardize his ability to play, and MLG was forced to make a decision on whether or not he was medically eligible. The injury made gripping the Xbox One controller almost impossible and severely limited his ability to play the game at a consistent professional level. FaZe went on to lose their first match of the day to Prophecy by a series score of 3-0. This dropped them to the loser’s bracket and made their road to first place much more difficult to conquer. Aches was not going to give up without a fight. He continued to play through all the blood, sweat, and emotion. However, there was a significant drop off in his overall performance. During his match against Team Kaliber later in the afternoon, Aches completed a highlight-reel worthy play to give his team the advantage. He explained that he could feel his hand pulsating and bleeding throughout his streak of kills and captures. Aches’ ability to continue to play at a professional level with his injury was astounding. According to CoD Competitive Stats, Aches’ overall Kill-to-Death ratio before the injury was 1.18. After the injury, it understandably dropped to 0.95. To the surprise of many, FaZe found themselves in the Grand Finals after winning several series in a row that went down to the wire. Their opponents in the championship matchup were none other than Aches’ rivals at OpTic Gaming. You could not script a better story. OpTic Gaming had been playing extremely well all day and did not lose a single map in their two earlier matchups. FaZe had to win two separate best-of-five series to take home the Championship and OpTic only needed one because they advanced to the finals through the winner’s bracket. At this point in the night, Aches’ hand was incredibly swollen and looked like it was ready to burst. The Grand Finals began on time and the first two games of the series were completed when all of the sudden, MLG’s live stream went down. It took over an hour to get the feed back up and resume play with the series tied 1-1. FaZe managed to come out strong against OpTic when the finals resumed, and won the first series in thrilling fashion during overtime in Game 4 of the series. The series win for FaZe forced a final series to determine who would win the championship. Aches and his team continued to shock the world by winning the first game of the series in the last few seconds of regulation. Taking the first map of a series was crucial, as both teams were playing very well. In the second map of the series, Aches found himself in a 1v1 situation against Formal in Round 11 of the Search and Destroy game. Aches managed to come out on top and win the game for his team, giving them a 2-0 lead in the series. FaZe was in the driver’s seat for the rest of the series and only needed one more map win to be crowned Champions. However, OpTic had other plans and fought their way back into the series by winning the next two maps. It all came down to a final game of Search and Destroy that would determine who goes home as Champions of the first Advanced Warfare event. The crowd at the venue was going crazy with fans from both teams screaming and taunting each other. Again, FaZe found themselves backed up against a wall, with all of the momentum in OpTic’s control. Aches thrives when facing elimination and he was not about to let his team lose the series after going up 2-0 to start it off. At one point during the last game, OpTic held a 3-2 lead in the best of 11 game of S&D. FaZe went on to win the next three rounds to go up 5-3, needing one more round to take home the win. OpTic won the next round to cut the lead to 5-4, but FaZe stopped them right in their tracks by taking the next round in dramatic fashion to win the championship. The entire team erupted from the playing booth and immediately shared a group hug to celebrate their victory. Aches ran out of the booth to find his girlfriend waiting for him, as well as all of the owners and fans from FaZe clan. The venue was filled with emotion, as fans from FaZe experienced pure jubilation, while fans from OpTic experienced a feeling of disappointment and shock. FaZe had just completed one of the greatest Grand Finals upsets in CoD eSports history. The championship win gave Aches his 19th major title, surpassing his longtime teammate, TeePee. The victory was also FaZe Clan’s first MLG Championship in the history of the organization. Winning the event with his new teammates at FaZe made the feeling even sweeter for the greatest player of all time in CoD eSports. The ‘Red Militia’ got their nickname from the red FaZe logo that has become one of the most well known brands in Call of Duty. FaZe Clan is prominently known for their YouTube channel that has close to 3 million subscribers watching their sniper team on a daily basis. With the recent resurgence of CoD eSports, FaZe has been attempting to expand their fan base even further. Aches can now take some time off to let his hand heal in preparation for the first season of the MLG CoD League for AW, as well as the next major event in Orlando at the start of the new year. FaZe has proven they can be the best team in the game, and Aches is hungry to begin another streak of championship wins. He is, after all, the greatest player in the history of competitive Call of Duty. A: The Shrimp Pasta my girlfriend makes me. Q: Favorite Call of Duty game? A: Honestly, no favorite. Loving Advanced Warfare so far though! Thank you to my teammates, my fans, my girlfriend, all the guys at FaZe, the Red Militia, and my family for all the support. Wouldn”t be here without any of you. Shoutout to GFuel, Scuf, Astro, and DXRacer for the amazing products and support you guys provide. At last, thank you Thomas and ESN for taking the time to do this article, I had a blast.